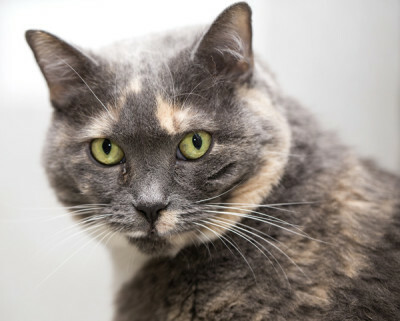 Adorable little lovebug BoPo is super affectionate and can purr up a storm! Initially, she’s a little nervous when meeting new people but if you show her some love and affection, she’ll become your best friend in no time! She’s about fourteen pounds and a bit overweight (rotund but still cute! 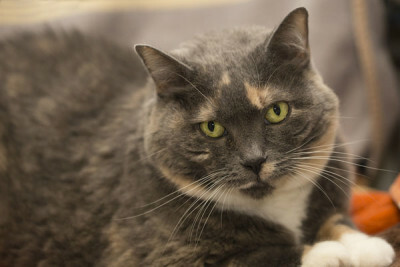 ), so she would love a home where her owners can get her to a healthier weight. BoPo is fine with being in a single cat household as she prefers to be the queen of her castle. 2015-10-17: Beautiful, sweet BoPo and Elsa have been adopted to the same forever home! Both kitties are now becoming accustomed to their new family and surroundings, and expect to live long, happy lives, in peace and comfort.